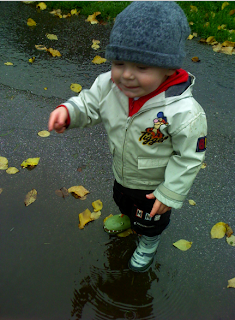 It is raining and that means puddle jumping...which I like but I dont like cleaning the dog afterwards. She was something of a mud ball after the whole spelunking we did in the panhandle. Clinton and I watched Casablanca last night. He had not seen it before. I had forgotten how funny the bar staff were. Those one line zingers are great. There really is something to be said about the movies that were made then...Less action. More intelligence. Hmm.. The days before television. And cable. Much more productive. I have loads more to say but I have no way to get them out without sounding weird. So I will wait until I can figure it out. I read in SFist that the state is trying to figure out how to get a superfast train to go between up here and LA. Oh that would be awesome!! Something like 2 hours. Perfect! We could get a zipcar in LA...Go to all the great museums and come back - IN ONE DAY!!!! Awww, well. At least I think so. Who knows really. I think we have about as many puddles up here too and our back yard is turning into a mud pit! My poor dogs I am like "do you REALLY need to go to the bathroom?"